Well, I might just be a true runner as I made my run with my hangover on Wednesday and then I ran to work on the Thursday. Friday and Saturday the trainers got a rest while I prepared for my second ever race - Vale of Leven 5k. Given my two weeks training in my new insoles I was concerned that I was not going to be able to beat my PB of 34 minutes. The route seemed and was very forgiving but sadly the on the day the weather was not. It was hot and my feet complained all the way round. In my traditional style of ill race preparation I didn't carry any water so was running round gasping for a drink although at least DQ didn't have to provide socks like last time. I made it in 30 minutes which put me 53rd out of 122 runners. Not great but at least it was faster than my previous. I was going to put up my piccie but my phone has been taken to the phone hospital. So you just have to imagine me wearing a medal with a big red face! From reading the blogs it seems a few family members were also in attendance but I didn't see anyone which is a shame but then again the 10k and 5k were kept separate so that is probably why. 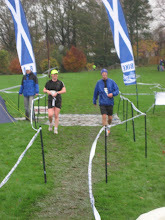 During the same weekend the Lovely Lee and her team did brilliantly and completed the Caley Challenge. What an achievement and I can't wait to see her at the race next weekend to give her a huge well done hug!!! As a result of the hot feet I took a jaunt up to run and become at lunchtime for socks and as I was reviewing the sock collection I heard a familiar voice. Mr Drummond was in buying trainers. It was lovely to see him and he advised me to save my money and get my socks at Tesco - right in front of Adrian - only Jim!! The race is only a few days away and I am starting to get concerned that I have got everything that I need. Of course this year I need to pack a lipgloss and at least ten change of outfits as the BBC Adventure show are going to be based at Kinlochleven. My better half is used to media attention but I am not so sure. I am going to encourage only ultra runners to be in front of the camera and then there is no risk of me being on. Anyway I really should be getting some shut eye as I am up early to run to work and I want to avoid the angry commuters. Last week I nearly lost an eye to a women and her brolly as she stomped her way to work with that lovely look of sooking lemons. You must have ran past Marco and I who were standing at the last turn before the finish. He had a big orange smock thing on and we were both taking pics. I'm off to see if I caught you on camera, but I missed half my pals that I knew were running so I don't hold out much hope! See you at the weekend. And guess what? I did.Click on Davie to read my latest illustrated post!